says Dr Ben Smith, author and Creative Writing Lecturer at the University of Plymouth. Themes of permanence and decay, of deep geological timeframes and our own human-centric sense of time have fascinated Ben for many years and they permeate his forthcoming debut novel Doggerland. So too do the author’s interests in predictive scientific research, in climate change, and the influence that environment and landscapes exert upon story-telling. says Ben, who joined the University six years ago, at a time when he had just started to write the book. The story that emerges from the harsh, salt-encrusted surroundings of Doggerland is, above all, a “human one” according to Ben. It centres upon The Old Man and The Boy, who’ve been sent by ‘The Company’ to crew the titular off-shore windfarm in the middle of the North Sea. In the face of intense isolation and loneliness, and the monotony of their routine, the pair choose very different methods of keeping the boredom at bay. The Old Man passes his time trawling the sea bed, fishing up relics from Doggerland, the ancient, near-mythical landmass that connected Britain to continental Europe in the Mesolithic era before it was subsumed by rising sea levels. The Boy, meanwhile, focuses upon getting on with his work, and endeavouring to keep the various systems functioning in the face of the unflinching, unrelenting elements. Doggerland is interesting because it was the last time a major climate event occurred on the earth and it had a huge impact on the people who were living in Northern Europe. The reason we have so many flood myths in global mythology is because of those floods at the end of the last Ice Age that caused such devastation. That’s why we have stories like Noah’s Ark. So I was interested in what this last major global climate change could tell us about our capacity to deal with, or not deal with, the current climate change. 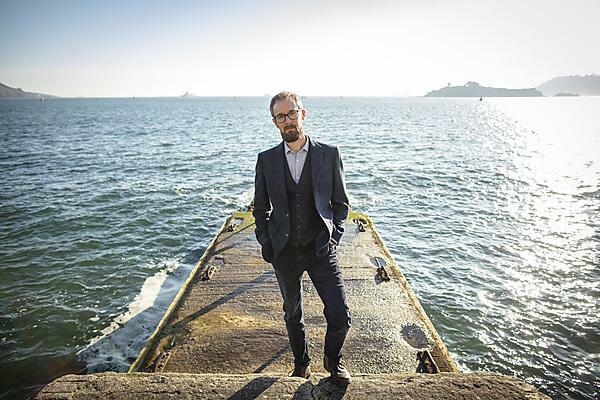 Dr Ben Smith on the geological inspiration behind his novel Doggerland. Doggerland has been described by author Melissa Harrison as “The Road meets Waiting for Godot”. It turns out that this was precisely the desired effect. says Ben when asked about his literary inspirations. A published poet, Doggerland is Ben’s first attempt at tackling a longer literary format, and dealing with “novel-sized ideas”. It was an experience he relished, and one helped by the insight he’d gained from working with his wife, the author Lucy Wood, on her debut novel Weathering. And despite the obvious challenges of juggling university teaching commitments with the need for solitary confinement during the writing process, Ben has been able to bring the two together to good effect. I always talk to my students about the ‘size’ of their ideas, especially when they’re getting up to dissertation or masters level. It’s about thinking about the size of the idea they have – whether it is a short story, a novel, or even a poem. Dr Ben Smith on the advice he gives to students - how an idea will fit a certain mode of writing. Doggerland will be published on 4 April, and as part of a publicity tour, Ben will be doing a public reading and talk at the University on 1 April. He is, he says, too busy to be nervous about it landing on bookshelves – but he’s already thinking ahead to a second novel among a host of other projects. “I am working on more poetry, and hoping to undertake new projects with marine scientists and those in our Sustainable Earth Institute,"
Stephen King talks about the importance of ‘writing with the study door closed’. You have to do that first, and then at some point when you are happy with what you’ve done, where it’s in a state where it needs another writer, you open the door and let someone in. And when you’re editing, you’re writing with the study door open. Dr Ben Smith on the difference between writing a novel, and working with an editor on your novel.